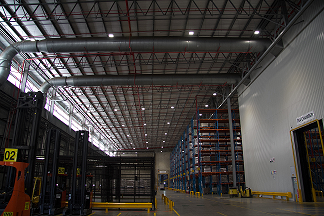 Magnet has recently completed the design and installation of a new energy-efficient lighting system at Unilever’s warehouse in Pietermaritzburg, KwaZulu-Natal. 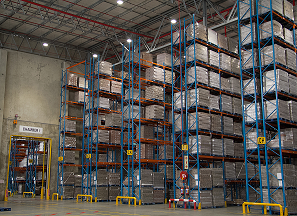 “The objective of this project was to design, supply and install a new lighting system that would improve lighting levels in the warehouse and also reduce energy consumption,” explains Mukhtar Khan, project manager, Magnet. “The Magnet team’s energy-saving solutions for this 45 000 mᶟ building, encompassed the replacement of existing T-bay fittings and fluorescent tubes, with Philips High Bay light emitting diode (LED) luminaires. A view of the front section of the warehouse depicting the new lighting layout. The previous light configuration required lights on a row by row basis, whereas Magnet’s design required lights at every second aisle within the front section. With the use of the latest lighting technology, Magnet’s custom-made lighting design utilised approximately 170 fewer light fittings than the previous system and is also more energy efficient, with expected savings of up to 62 %. These robust components offer extended service life and need minimal maintenance. A view from the front of the warehouse towards the aisles of racking. The lux level throughout the warehouse has been significantly improved post project completion. Improved quality of illuminance levels in the warehouse offers enhanced comfort for workers – an important feature of the installation. In line with Unilever’s ‘zero-waste-to-landfill’ policy, all redundant T-Bay fixtures and fluorescent tubes were re-cycled. Magnet’s support service to this Unilever warehouse facility, includes site audits, where performance of luminaires is monitored.